I had about 3 minutes left and having a feeling that there something here, started to look. Sure it was. I hope you easily find it. Interesting, that this pattern doesn’t have a name, like Boden’s mate or Anastasia mate, though it’s actually close to the one known. It was also Petroff (though I played Black) and my bishops allowed me to win in the middlegame (this time their strength showed also in the endgame). I got some advantage in the opening, maybe Petroff was an opening experiment for my opponent, at least I didn’t see in DB him playing it before. He gave me two bishops, I increased pressure and was able to win a central pawn, then I forced exchange of the queens and got a 2B vs. B+N endgame with passed pawn on d5 and very good chances to win. The bishops supported advancing of the pawn, they were very strong. After my opponent gave up a knight for the pawn, he still continued to play unless he had just a king. After not playing well in the last 3 rounds I really tried to get myself together (I even came to the club 40 minutes before the game, walked in the park, etc.) and I am glad that I finished the tournament on a good note. I got 5 out of 9 and my rating is going back to “A”. I played yesterday and it was a disaster. I feel like a cook, who was preparing an unknown dish and screwed up every component of it. I was Black, my opponent was a guy I played twice before – loss almost in the opening in the first game, revenge in the endgame in the second. This game was somewhat similar to the first. He was White, played 1.d4 and 2. c4, and I wanted to play Benko, but already on the 3rd move he played the move nobody ever played before, here is the game. On move 6 I got the wrong idea that the exchange of the dark-colored bishops will be not good for me and played h5 to avoid it. Actually, after 6. … Bg7 7. 7. Bh6 Qb6 (stressing the weakness of his queenside) I was getting -0.91 advantage. 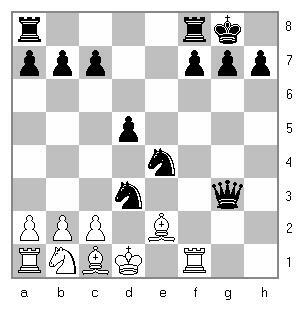 Then I overestimated his tactical threats after Bf4 – Nb5, Nc7+, not seeing Qa5 check after which his knight had to go back. My move 8… a6 was beginning of the disaster and then I gave up a pawn, thinking that after 9…Nxd5 I will get under pin, but after 10. Rd1 e6 he had to move or exchange his queen. When I moved knight to a5, I saw that it can go to c4, but when he played 10. Be5 I concentrated on the kingside, played 10… g7 and after 11. b4 realised with horror that the knight can’t go now to c4 and after 11…Nb3 12. Rb1 can’t go anywhere. Anyway, I continued to play, but after losing another piece on move 31, I resigned. It looks like I was looking for adventures in the game I played this Thursday. It was an old gentleman I drew 2 times before. I was White and was expecting Alekhine defense from him (he played it in the club before), being sure he won’t repeat French. He played … Scandinavian, the opening I have a bad record with: =1, -3, though in the last game I was better after the first 13-15 moves. Anyway, he played the “classical” line 3…Qa5, here is the game. I thought that I stumbled, moving 5. Qd3, completely forgetting that Bf5 is possible because the queen is on a5. But it was actually a book move, even with 53-54% score. Anyway, I was OK, a few exchanges followed, and then he offered a queen exchange. It confirmed my feeling that he wants a draw. I was kind of not in the mood to make another draw, but he threatened to take a pawn on a2, if I would refuse. I looked and decided that after Qxa2, Ra1, Qb3, Rxa2 I get my pawn back, but after the move realized that queen can go back to d5 and defend the pawn. Fritz later also refused to exchange, but found a better way of implementing it and got the pawn back. I got nervous and tried to create complications on the kingside. I actually succeeded after he allowed me to take his knight on f6 and break his king’s cover. I found the pawn sac – f5, but played it a move later than needed, so instead of getting 0.8 better I got 0.8 worse and then we both missed a crucial combo – 34. … Rxg2+ 35. Qxg2 Rg8 36. Qxg8+ Kxg8, that was getting him Q+2P vs. 2R endgame with very active queen and passed pawns which is won for Black (2 shootouts confirm that). Instead he eventually went for queen exchange that was good for me, I activated my rook and it made the game almost equal. At one moment I got two connected passed pawns on “c” and “d”, but I was afraid of his passed “a” pawn, so exchanged “c” for “a”. I thought later, that it was a moment when I could win, but Fritz said that it was not possible to keep the pawns. Then finally we got in R vs. R endgame, with me having “d” and him doubled “f” pawns. I didn’t estimate the position right and went ahead with the king trying to support my pawn, instead of exchanging it for his “f” and getting into drawn ending with my king on the way of his remaining “f” pawn. Then I noticed that he is getting into time trouble, spending more time than me on every move. When he had 48 seconds (I had ~2 minutes 20 seconds) he offered a draw. I didn’t feel like refusing it (I am not sure I would feel the same way, if it would be somebody else), he was better (though 2 computer shootouts ended in a draw), so I accepted it. I don’t think I deserved a win in this game. I played on Thursday and lost to an expert, rated 3rd in our section, still stings. Here is the game. He was White and played 1. e4, then went for some setup with d3 and c4. He pushed aggressively his pawns on the queenside, then on the kingside. Then after I counter-attacked with h5, and in the center with c6 and d5, he spent a lot of time and got behind by ~20 minutes. He blundered with 24. d4 and then made a crucial mistake with 26. f5. My answer was prepared, but I completely didn’t expect that he will not move his queen, which was attacked by the knight on c3. The line with Nxe2+ was winning, it was a consequence of the fact, that play opened with his king exposed, that’s what I intended by playing d5. But I greedily took his queen, not even completely realizing that he gets 3 minor pieces for that. Anyway, I thought I was better, Fritz confirms it, but the situation on the board changed, his passed pawn and bishops were very strong and it required very precise moves from me. I first played a bad move 34…Re6, losing my advantage, and then made a crucial mistake by playing 39…Qa3. He was in the time trouble, so I played until the bitter end (these moves are not worth posting), getting mated with his flag hanging. After the game in the post-mortem he overestimated his flank advances, but said that he was happy to get 3 pieces for the queen, so I have to admit that he estimated the position better than me and swindled me with 27. fxg6.